Possibilities are endless and we expand it to the core. 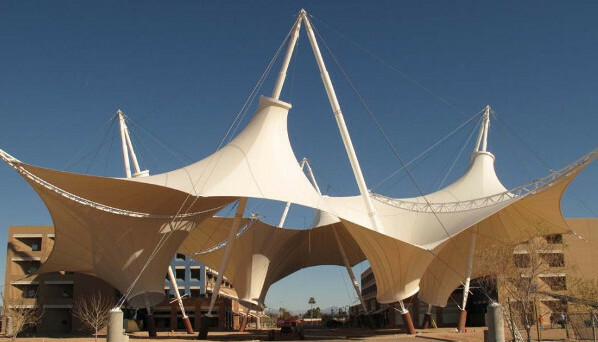 Architectural Tensile Membrane Structures are a striking and exciting new age method of construction. Designer Awning offers the potential to create spaces that are aesthetically pleasing and complement the natural environment. Tension structures utilize technical fabric roof membranes, combination of catenary cables and clamping systems and a minimal amount of framing to create proportionally lightweight structures capable of spanning great distances. Architect & Engineer both are the skeleton of every existing tensile structure membrane from their state of imagination. Generally every designs are built with computerized analysis and sustainability study. These structures are specially constructed for Business Auction, Stadium and commercial industry.